Fruits, in general, are not a very rich source of dietary (non-heme) iron. 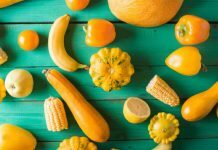 However, because fruits are often rich in vitamin C, its absorption into our body is usually much higher than from other foods that may contain more of this crucial mineral. That is why you should not ignore fruits as a supplementary source of iron in your diet. Below you will find a list of 30 fruits that contain the highest amount of this substance. Did you know that tomatoes are technically considered a fruit? And surprisingly, sundried tomatoes are fruit richest in plant-based iron. Actually, you can find over 9.1mg of iron per a 3.5oz (100g) serving. With regards to other minerals, you can find a huge amounts of potassium (3427mg), sodium (2095mg), phosphorus (356mg), magnesium (194mg), calcium (110mg), zinc (2.0mg), copper (1.4mg), and manganese (1.8mg). 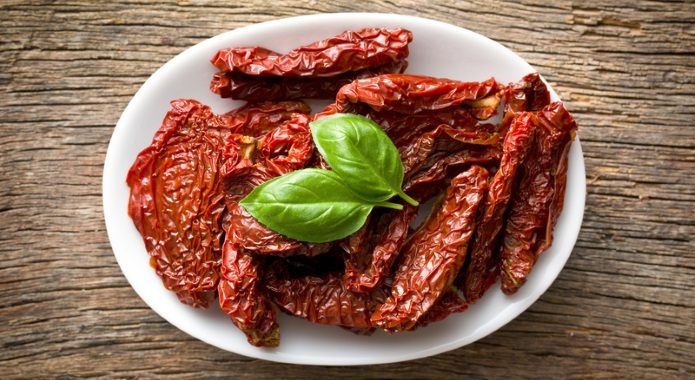 Surprisingly, sundried tomatoes contain a lot of vitamins as well. 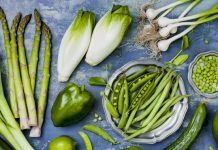 You can find choline (105mg), vitamin C (39.2mg), niacin (9.0mg), pantothenic acid (2.1mg), vitamin A (874IU), folate (68.0mcg), and vitamin K (43.0mcg). This fruit contains only a small amount of water, but is mostly composed of proteins (14.1g), and carbohydrates (55.8g) such as sugars (37.6g per 3.5oz/100g serving). I love to add sundried tomatoes into pasta. There are also other recipes that use this fruit for various breads, salads, and soups. Did you know that olives are a fruit as well? This was a surprising discovery for me. Actually, it is the second fruit high in iron on this list. It will provide your body with 3.3mg of non-heme iron per 3.5oz (100g) serving. Not only that, olives are rich in other minerals such as sodium (872mg), and calcium (88.0mg). Except for 10.3mg of choline and 403IU of vitamin A, I was not able to discover any significant amounts of vitamins. Olives are composed mostly of water (80.0g) and provide your body with a small dose of carbohydrates (6.3g), and healthy fats (10.7g). Olives are an excellent addition to many meals. 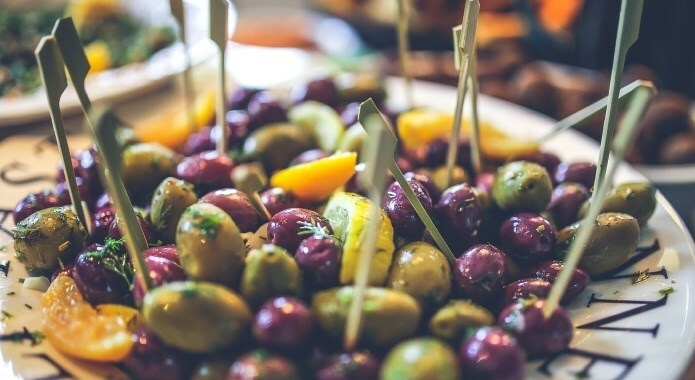 Just check out these tasty recipes to get some inspiration on how to incorporate more olives into your daily diet. Apricots, especially dried ones, are a rich source of plant-based iron as they provide your body with 2.7mg of this mineral per 3.5oz (100g) serving. This fruit also contains a lot of potassium (1162mg), phosphorus (71.0mg), calcium (55.0mg), and magnesium (32.0mg). 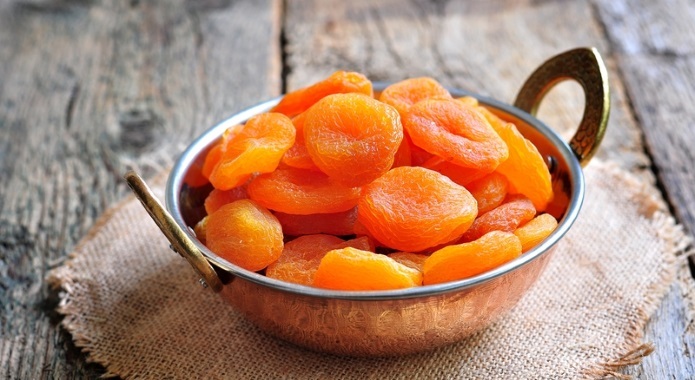 Dried apricots do not contain many vitamins except a substantial amount of vitamin A (3604IU). Except for vitamin A, there are only tiny amounts of choline (13.9mg), vitamin E (4.3mg), and niacin (2.6mg). Obviously, as this fruit is dried it contains only a small amount of water (30.9g) and a highly concentrated amount of carbohydrates (62.6g) and sugars (53.4g). Although I have never thought that dried fruits can be so versatile, these recipes have changed my mind. 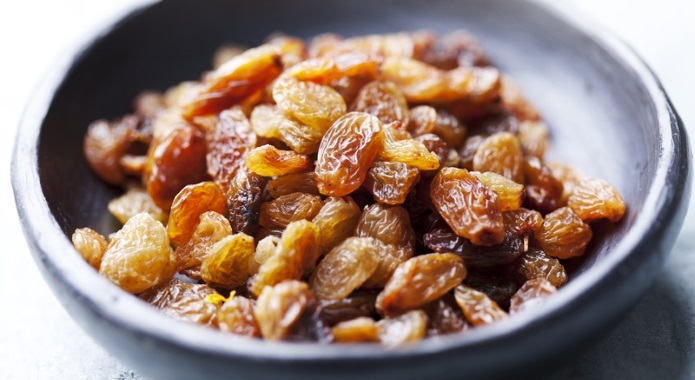 Seeded raisins, or dried grapes, will provide your body with 2.6mg of plant-based iron per 3.5oz (100g) serving. With regards to other minerals, seeded raisins provide only small amounts of potassium (825mg), phosphorus (75.0mg), magnesium (30.0mg), calcium (28.0mg), and sodium (28.0mg). Surprisingly, raisins do not provide any substantial amounts of vitamins except vitamin C (5.4mg). I was shocked by the huge amount of carbohydrates (78.5g per 3.5oz/100g serving). Raisins are ideal for breakfast or your morning oatmeal as they provide a lot of energy. However, thanks to these recipes you can use raisins in pies and cookies. 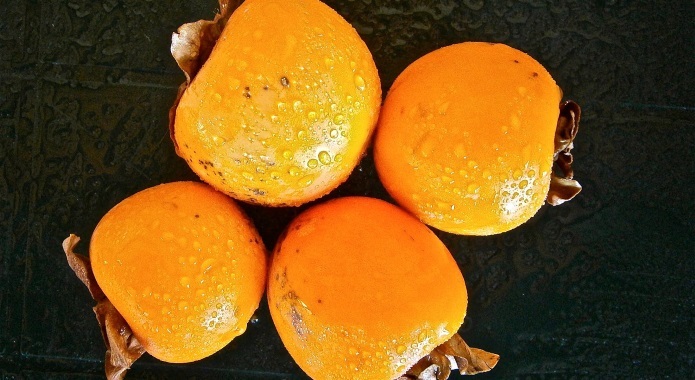 A 3.5oz (100g) serving of raw persimmons will provide your body with 2.5mg of iron. This fruit also includes other minerals, such as potassium (310mg), calcium (27.0mg), and phosphorus (26.0mg). Persimmons are extremely rich in vitamin C (66.0mg). This fruit does not contain as much water as others on this list (just 64.4g). However, it does provide a lot of energy in the form of carbs (33.5g per 3.5oz/100g serving). Although persimmons are not available all over the world, you can use them in many fall recipes. I am looking forward to making a persimmon salad. 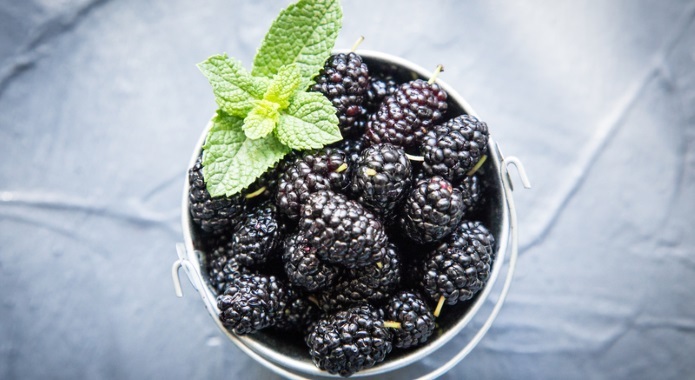 Mulberries are a fruit that provide a good dose of plant-based iron (1.9mg of iron per 3.5oz/100g serving). 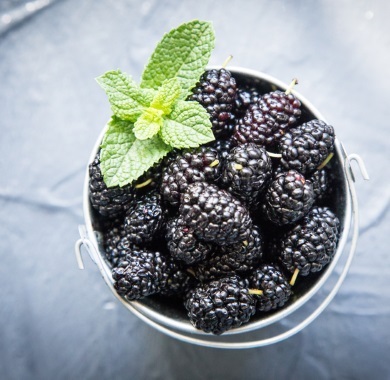 However, with regards to other minerals, mulberries provide only a limited amount of potassium (194mg), calcium (39.0mg), and phosphorus (38.0mg). 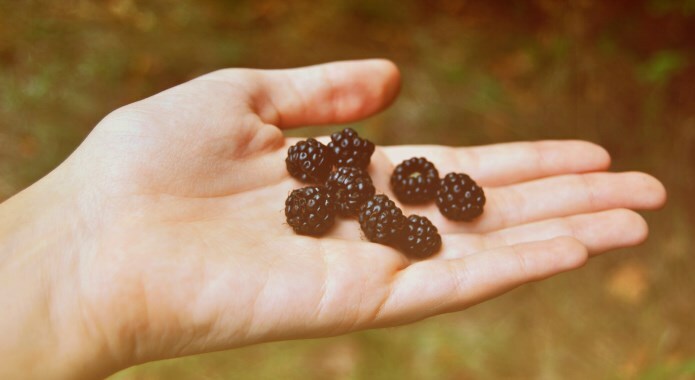 Mulberries also provide some vitamin C (36.4mg), choline (12.3mg), vitamin K (7.8mcg), and folate (6.0mcg). This fruit also contains a lot of water (87.7g) and a small amount of carbohydrates (just 9.8g per 3.5oz/100g serving). This makes it a perfect choice for losing weight. 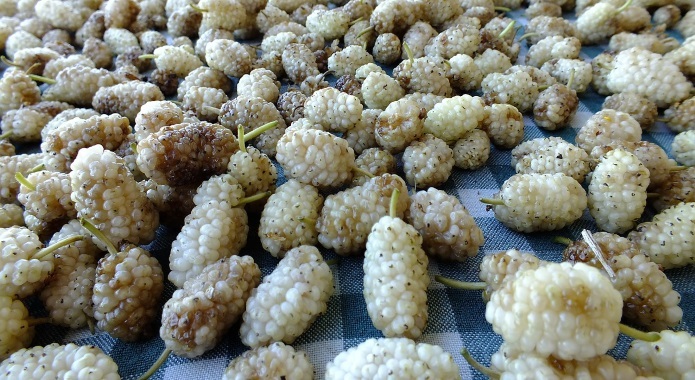 You can use mulberries in various pies or in larger fruit salads. Also, thanks to these recipes you can make your own sorbet or smoothie. Although many people do not know this fact, even elderberries are considered fruit. Actually, they are quite rich in iron (1.6mg or non-heme iron per 3.5oz/100g serving). The other minerals worth mentioning include potassium (280mg), phosphorus (39.0mg), and calcium (38.0mg). There is only a small amount of vitamin C (36.0mg), vitamin B6 (0.2mg), and vitamin A (600IU). 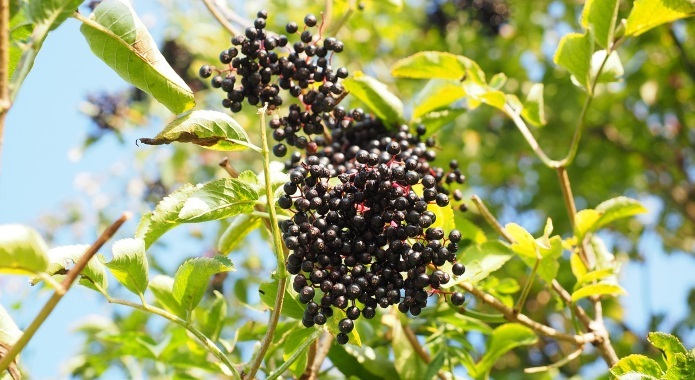 Elderberries are mostly composed of water (79.8g) and provide around 18.4g of carbohydrates. Surprisingly, there is a high fiber content (7.0g). I love elderberries as you can make a yam out of these. Also, you can try to make a liqueur. Just check out these recipes to learn more details. Black currants are a potent source of plant-based iron. Actually, they provide around 1.5mg of iron per a 3.5oz (100g) serving. 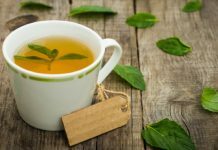 It does not provide any substantial amounts of other minerals, just a small amount of potassium (322mg), phosphorus (59.0mg), calcium (55.0mg), and magnesium (24.0mg). Black currants are a rich source of vitamin C (181mg). This fruit is mostly composed of water (81.9g) and provide a smaller amount of carbohydrates (15.4g). 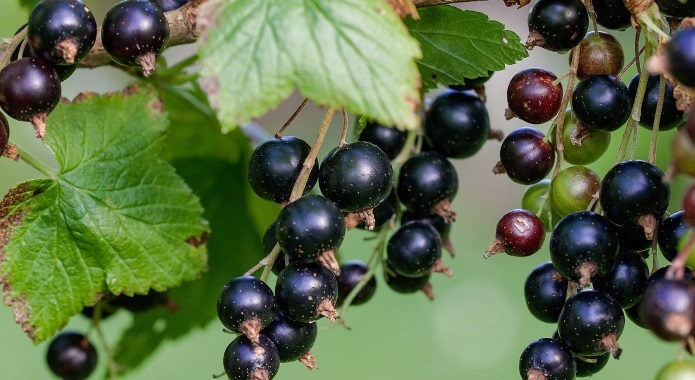 Black currants have been used in the past as a medication. Today, this healthy fruit is a part of many tasty recipes. A 3.5oz (100g) serving of red or white currants contains 1.0mg of plant-based iron. 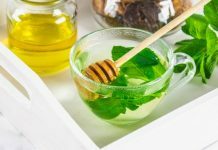 It also provides your body with small amounts of other minerals, such as potassium (275mg), phosphorus (44.0mg), calcium (33.0mg), and magnesium (13.0mg). 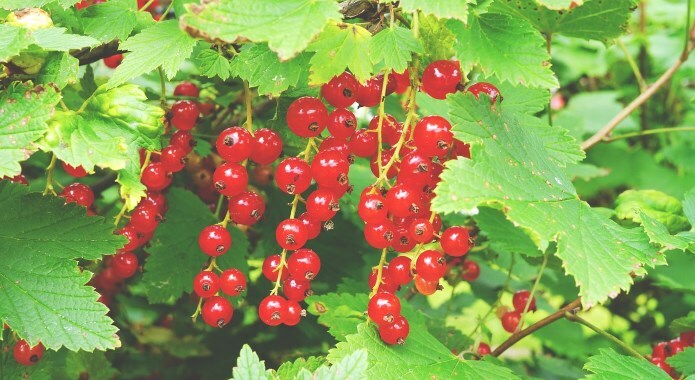 Red and also white currants provide a lot of vitamin C (41.0mg), and a small amount of vitamin K (11.0mcg). Currants are another fruit that is mostly composed of water (83.9g) and at the same time contain a limited amount of carbohydrates (just 13.8g per 3.5oz/100g serving). You can use currants in various desserts and relishes. Also, there are many recipes that combine currants with meat. A 3.5oz (100g) serving of Medjool dates will give your body approximately 0.9mg of plant-based iron. This fruit is rich in other minerals such as potassium (696mg), calcium (64.0mg), phosphorus (62.0mg), and magnesium (54.0mg). There are no significant amounts of vitamins in dates, except choline (9.9mg). 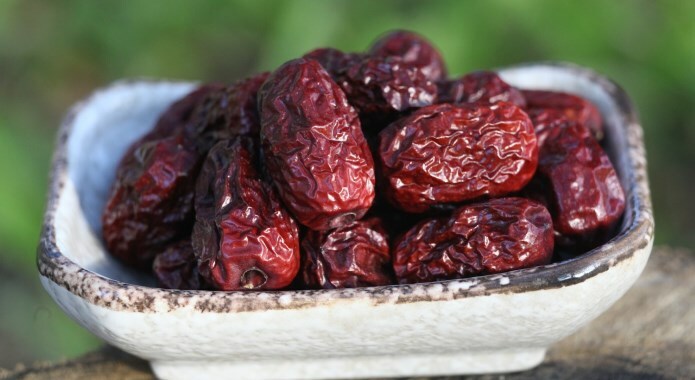 Dates are usually sold as a dried fruit, that is why they do not contain a lot of water (21.3g). Also, this fruit is rich in carbohydrates (75.0g) and sugars (66.5g). That is why they provide your body with a huge amount of energy. Dates are a crucial ingredient of raw cakes, oatmeals, and smoothies. Just check out these recipes to learn more. 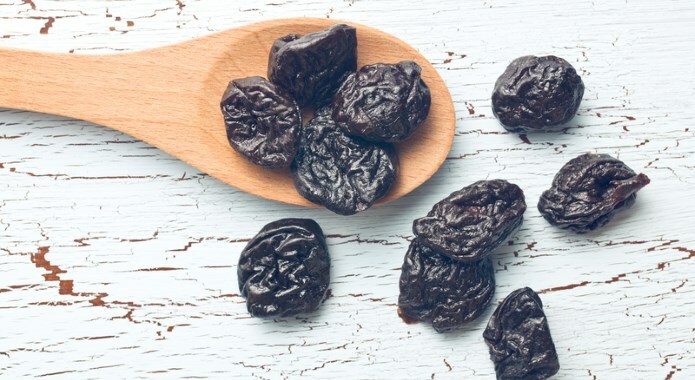 Prunes (dried plums) are a natural laxative that contains around 0.9mg of non-heme iron per 3.5oz (100g) serving. This fruit also contains around 732mg of potassium, 69.0mg of phosphorus, 43.0mg of calcium, and 41.0mg of magnesium. Dried fruits, in general, do not provide a lot of vitamins. I was surprised to notice that prunes are rich in choline (10.1mg), and vitamin K (59.5mcg). Although this fruit lacks a substantial amount of water, it provides an incredible amount of energy due to its high amount of carbohydrates (63.9g) and sugars (38.1g). There are many tasty recipes that combine prunes with various desserts, meats, and salads. All you have to do is to choose one that suits your taste buds. Lemons are not a great source of iron as they provide your body with only 0.7mg of plant-based iron. There are only small amounts of potassium (145mg), calcium (61.0mg), phosphorus (15.0mg), and magnesium (12.0mg). Lemons are an excellent source of vitamin C (77.0mg). 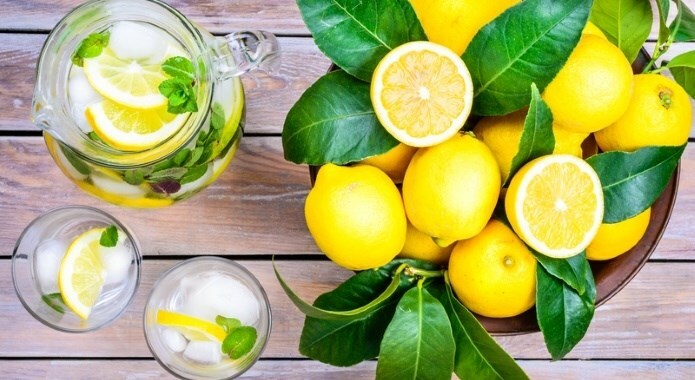 Also, lemons are composed mostly of water (87.4g) and provide some amount of energy in the form of carbohydrates (10.7g per 3.5oz/100g serving). According to these recipes, lemons are a perfect choice to make ingredients, salad dressings, and desserts. Fresh raspberries are quite nutritious. They provide your body with 0.7mg of non-heme iron per 3.5oz (100g) serving. This fruit also contains a small amount of potassium (151mg), phosphorus (29.0mg), calcium (25.0mg), magnesium (22.0mg), and manganese (0.7mg). It also provides your body with several vitamins, such as vitamin C (26.2mg), choline (12.3mg), folate (21.0mcg), and vitamin K (7.8mcg). 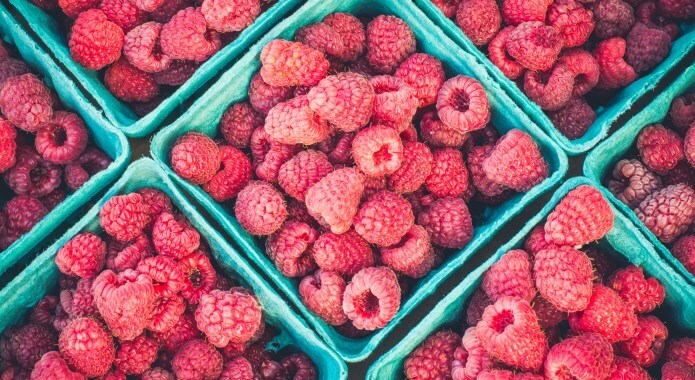 As with many other fruits on this list, raspberries are composed mostly of water (85.7g). They provide a smaller amount of carbohydrates (11.9g) and it makes this fruit a perfect choice for those who want to shed some pounds. Although plain raspberries taste great, there are many recipes where you can use this fruit as well. Blackberries are not very rich in minerals. They provide only 0.6mg of non-heme iron per a 3.5oz (100g) serving. There are tiny amounts of other minerals such as potassium (162mg), calcium (29.0mg), phosphorus (22.0mg), and magnesium (20.0mg). Blackberries provide only limited amounts of vitamin C (21.0mg), choline (8.5mg), folate (25.0mcg), and vitamin K (19.8mcg). This fruit, similarly as other berries on this list, is mostly composed of water (88.1g) and contains only a small amount of carbohydrates (10.2g). This makes it a perfect choice for those wanting to shed some pounds. There are many recipes for blackberries that are really tasty. Usually, blackberries are a part of desserts and smoothies. 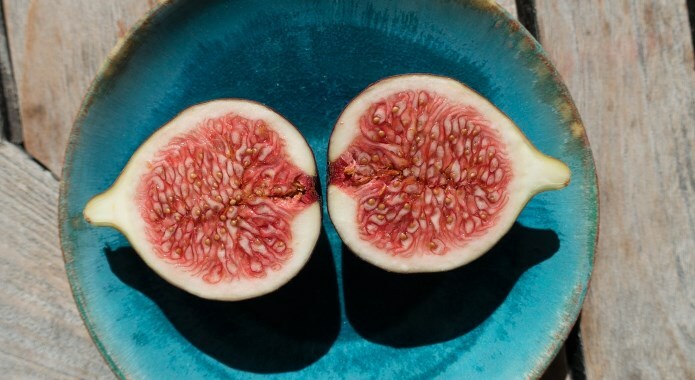 Did you know that a 3.5oz (100g) serving of raw figs will provide your body with just 0.4mg of plant-based iron? Other minerals that are hidden inside this fruit include potassium (232mg), calcium (35.0mg), magnesium (17.0mg), and phosphorus (14.0mg). Surprisingly, figs are lacking any substantial amounts of vitamins that would be worth mentioning. These fruits are mainly composed of water (79.1g) and provide a substantial amount of energy as these are rich in carbohydrates (19.2g) and sugars (16.3g per 3.5oz/100g serving). Figs taste excellent when caramelized and combined with goat cheese. Also, this fruit is an integral part of various salads. There are many more complex recipes you can try to incorporate figs into your daily diet. Almost everyone loves raw strawberries. This common fruit provides your body with 0.4mg of non-heme iron per 3.5oz (100g) serving. Also, there are tiny amounts of potassium (153mg), phosphorus (24.0mg), calcium (16.0mg), and magnesium (13.0mg). With regards to vitamins, there is only a substantial amount of vitamin C (58.8mg), and choline (5.7mg). 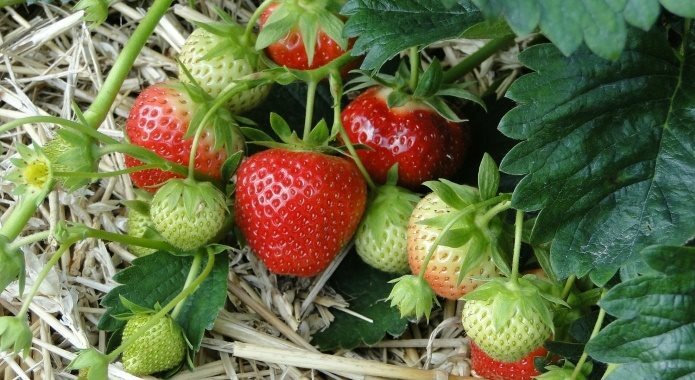 Strawberries are a fruit that is richest in water (90.9g) and at the same time contain minimal amounts of carbohydrates (7.7g) and sugars (4.9g per 3.5oz /100g serving). This is a perfect choice for those who want to snack while trying to lose weight at the same time. There are many recipes for strawberries. Just choose the one you like the most. Although bananas are not a fruit that is richest in iron, they are very nutritious. They contain only 0.3mg of non-heme iron per 3.5oz (100g) serving. 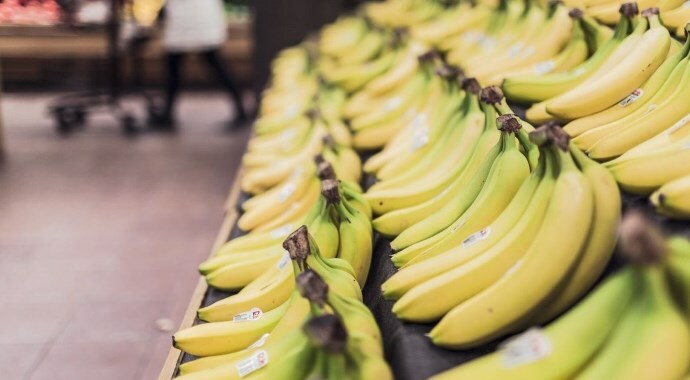 Also, bananas provide your body with several other minerals, such as potassium (358mg), magnesium (27.0mg), phosphorus (22.0mg), and calcium (5.0mg). Vitamins hidden in bananas are scarce, including only a tiny amounts of choline (9.8mg), and vitamin C (8.7mg). The majority of a banana is composed of water (74.9g) and provides your body with a lot of energy thanks to 22.8g of carbohydrates. I consider bananas to be one of the most universal fruits out there. You can eat these plain, blend these into smoothies, add them to salads, or even into your main meals. Just have a look at these recipes to find some inspiration. 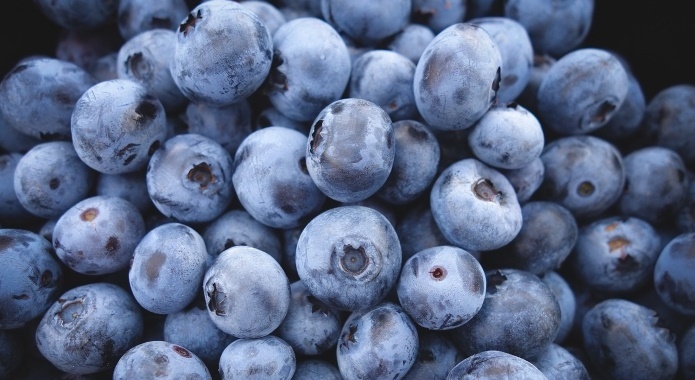 A 3.5oz (100g) serving of blueberries will give you 0.3mg of plant-based iron. It contains a very limited amount of other minerals, such as potassium (77mg), and phosphorus (12.0mg). There is only a limited amount of vitamin C (9.7mg), choline (6.0mg), vitamin K (19.3mcg), and folate (6.0mcg). It includes an incredible amount of water (84.2g) and provides a good amount of carbohydrates (14.5g) and sugars (10.0g). Blueberries are usually used in recipes for desserts. However, I would recommend you to eat this fruit raw as this way it includes the most minerals and vitamins in it. Raw cranberries are not very high on this list as this fruit provides your body with a mere 0.3mg of plant-based iron per 3.5oz (100g) serving. As you already know, this is not a big number. Sadly, cranberries provide only a very limited amount of other minerals, including potassium (85.0mg), phosphorus (13.0mg), calcium (8.0mg), and magnesium (6.0mg). After analyzing its vitamin content, I have to say that this fruit has not very much to provide except some vitamin C (13.3mg), and choline (5.5mg). 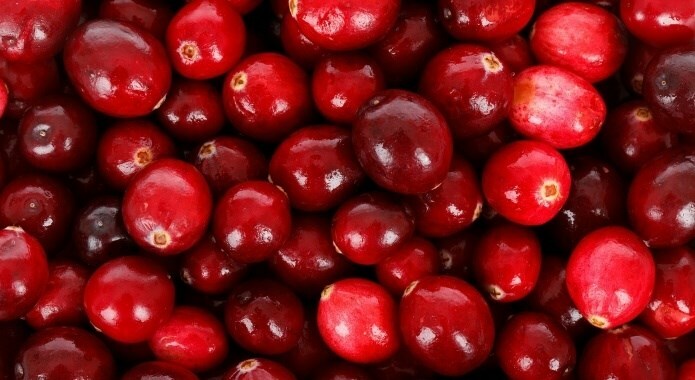 Although cranberries are composed mostly of water (87.1g), they provide a small number of carbs (12.2g) out of which there is only 4g of sugars. Cranberries are excellent for various sauces, jellies, and jams. However, I love them the most in my breakfast cereals and oatmeal. Just check out these recipes for some inspiration. A 3.5oz (100g) serving of kiwi will give your body just a mere 0.3mg of plant-based iron. 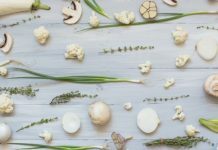 There is only a limited amount of other minerals, such as potassium (312mg), phosphorus (34.0mg), calcium (34.0mg), and magnesium (17.0mg). You can find only several vitamins in kiwi, such as vitamin C (92.7mg), choline (7.8mg), vitamin K (40.3mcg), and (25.0mcg). There is a lot of water in kiwi (83.1g) and you will find a good amount of carbohydrates (14.7g) in this fruit as well. 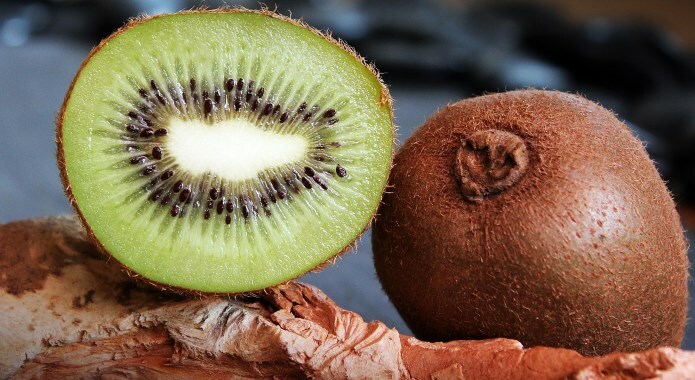 If you want to add more kiwi into your diet, try these tasty recipes. 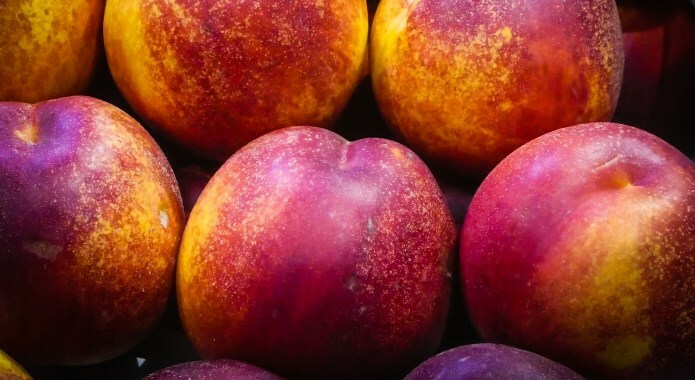 Nectarines are one of my most favorite fruits in the world. Although they do not provide a lot of iron (actually just 0.3mg per 3.5oz/100g), they have an excellent taste. With regards to other minerals, nectarines provide some potassium (201mg), phosphorus (26.0mg), magnesium (9.0mg), and calcium (6.0mg). Sadly, nectarines do not provide a lot of vitamins. Just a small amount of choline (6.2mg), and vitamin C (5.4mg). This fruit is mostly composed of water (87.6g), and a small portion of carbohydrates (10.6g). I love to eat nectarines plain, without any additions. 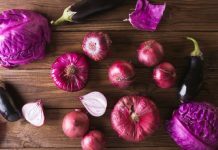 However, if you want to make something more colorful, try adding them to your salad or check out some of these recipes. A 3.5oz (100g) serving of pineapple will provide your body with 0.3mg of plant-based iron. Also, you will find some potassium (109mg), calcium (13.0mg), magnesium (12.0mg), and manganese (0.9mg). There is only some vitamin C (47.8mg) with regards to vitamin content of pineapple. 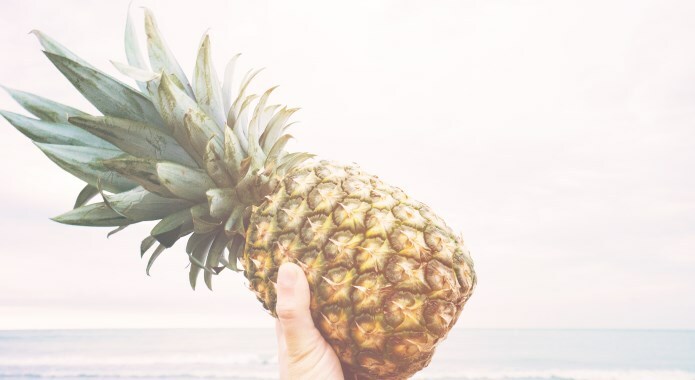 Pineapple is a good source of energy in the form of carbohydrates (13.1g) and sugars (9.8g). Also, it is mostly composed of water (86.0g per 3.5oz/100g serving). I love roasted and caramelised pineapples. However, you can try some other recipes as well. 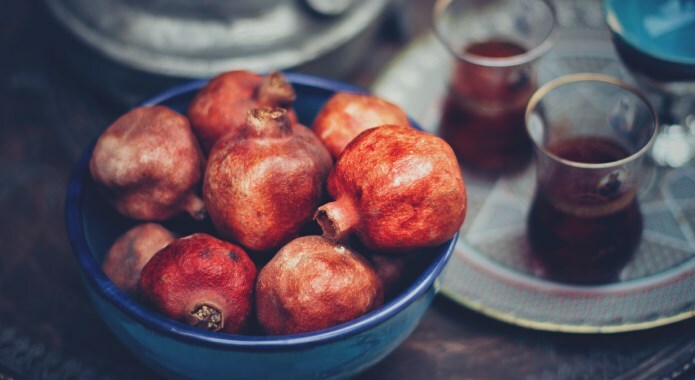 Pomegranates are not very rich in plant-based iron (just 0.3mg per 3.5oz/100g serving). This juicy fruit contains just a small amount of other minerals, including potassium (236mg), phosphorus (36.0mg), magnesium (12.0mg), and calcium (10.0mg). Also, this fruit provides your body with some important vitamins, such as vitamin C (10.2mg), choline (7.6mg), folate (38.0mcg), and vitamin K (16.4mcg). What surprised me is the fact that it does not contain as much water as other fruits on this list (just 77.9g), it provides a lot of carbohydrates (18.7g) and sugars (13.7g). Pomegranates are excellent to make juices and smoothies as they add a lot of sweetness to these. Also, you can use them to add bright colors to your meals. However, I love to throw few pomegranate seeds into my morning oatmeal. Just check these recipes for more ideas. A 3.5oz (100g) serving of watermelon contains around 0.2mg of non-heme iron. As you can see, that is not a huge amount. Other minerals are present only in very limited amounts, such as potassium (112mg), phosphorus (11.0mg), and magnesium (10.0mg). There are minimal amounts of vitamins as well. Just 8.1mg of vitamin C, and 4.1mg of choline. Surprisingly, watermelon has an almost identical amount of water in it as strawberries (91.5g) and this fruit provides only a tiny amount of carbohydrates (just 7.5g). 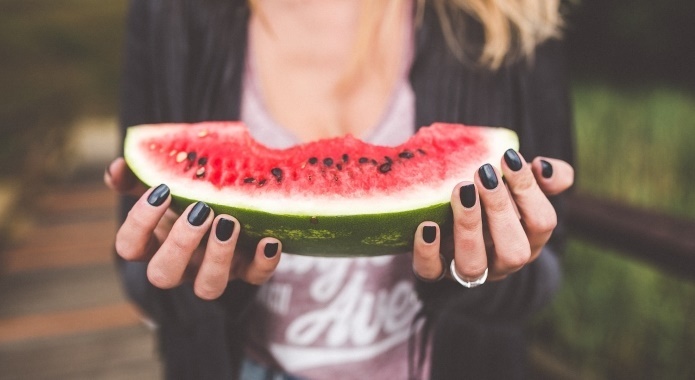 If you want to shed some pounds, snack on a fresh watermelon or try some of these recipes. 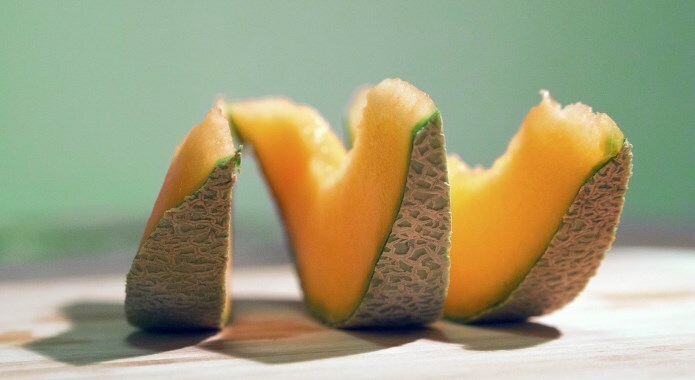 Cantaloupe does not provide your body with many minerals. It contains just 0.2mg of plant-based iron per 3.5oz (100g) serving. Also, it gives only a limited amount of potassium (267mg), sodium (16.0mg), phosphorus (15.0mg), and magnesium (12.0mg). Surprisingly, this fruit gives a substantial amount of vitamin C (36.7mg), and vitamin A (3382IU). Did you know that cantaloupe is composed mostly of water (90.2g per 3.55oz/100g serving)? The best part is that it does not have a huge amount of carbohydrates (just 8.8g) that makes it a perfect filling fruit ideal for losing weight. Cantaloupe is famous in various salads, salsas, and in recipes that combine sweet taste with various meats. I recommend to check out these recipes as there are many for you to choose from. I bet you will find one that will suit your taste buds. Apples are first in the group of fruits that contain almost no plant-based iron in it. In fact, you will find just 0.1mg of iron per 3.5oz (100g) serving of fresh apples with skin. When looking at other minerals present in apples, I have found only potassium to be worth mentioning (just 107mg per 3.5oz/100g serving). 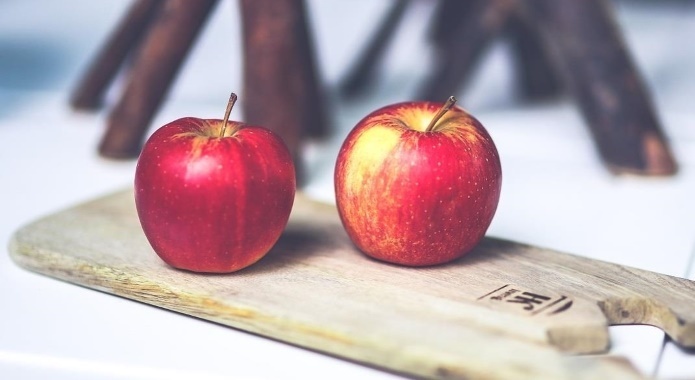 With regards to vitamins, apples provide a tiny amount of vitamin C (4.6mg), and choline (3.4mg). The majority of its content is a water (85.6g per 3.5oz/100g). Apples are an excellent fruit. They are filling (especially when combined with a glass of water) and provide a lot of energy for your body. You can eat them whole or you can incorporate these into a fruit salad. If you want to try something more extraordinary, you can try these apple recipes. 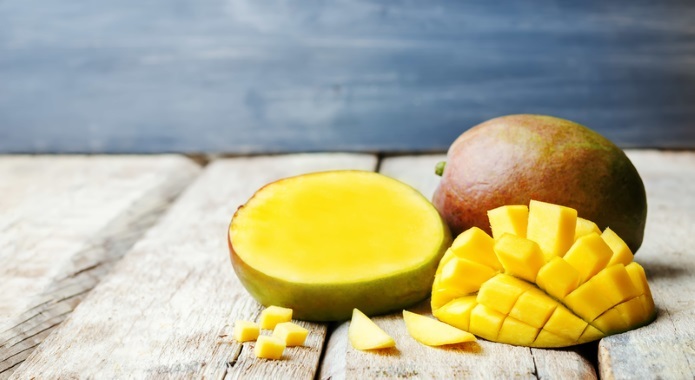 Mangoes are lacking almost any iron in it as it provides just 0.1mg of non-heme iron per 3.5oz (100g) serving. Sadly, there are no other minerals in mangoes worth mentioning except potassium (156mg). With regards to vitamins, mangoes provide a good amount of vitamin C and vitamin A. The majority of its content is a refreshing water (81.7g per 3.5oz/100g). I love ripe mangoes as they are incredibly tasty and provide a lot of energy from its high sugar content. I love to combine the sweet taste of grilled mangoes (caramelized) with something salty. You can get inspiration on how to prepare some delicious desserts from these recipes. Oranges are another fruit that is not very rich in iron. As with apples and mangoes, oranges provide only a mere 0.1mg of non-heme iron per 3.5oz (100g) serving. Other minerals worth mentioning include potassium (181mg) and calcium (40mg). There are no substantial amounts of vitamins in oranges either except vitamin C (53.2mg), and choline (8.4mg). Oranges are mostly composed of water (86.7g per 3.5oz/100g) and contain a substantial amount of energy in form of carbohydrates (11.7g). Each and every one of us knows oranges and often eats them raw. However, did you know that oranges are excellent in various much more complex meals? Just have a look at these recipes. 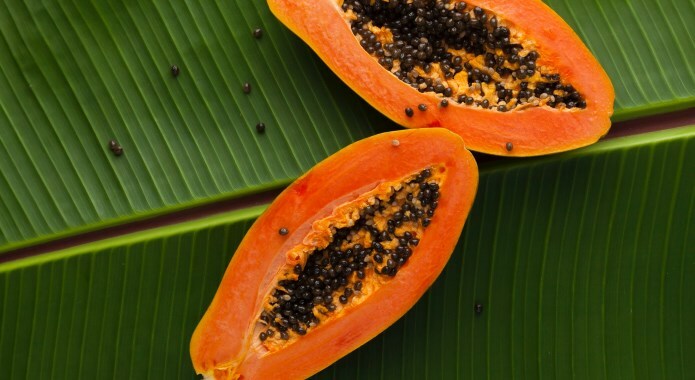 Papayas are another fruit that is on this list. It provides only a 0.1mg of non-heme iron per 3.5oz (100g) serving. It also includes a small amount of potassium (257mg), calcium (24.0mg), magnesium (10mg), and phosphorus (5.0mg). Papaya provides several vitamins, including vitamin C (61.8mg), vitamin A (1094 IU), choline (6.1mg), and folate (38mcg). This fruit is mostly water (88.8g per 3.5oz/100g) and contains a not that high amount of carbohydrates (just 9.8g). Although papayas may not be available all over the world, this fruit has a firm place in many recipes for colorful fruit salads. Also, papaya is often used in many recipes combining sweet and salty taste. Grapefruits are in the last position on this list. They provide just 0.1mg of iron per 3.5oz (100g) serving. Surprisingly, there is also a small portion of potassium (135mg), calcium (22.0mg), phosphorus (18.0mg), and magnesium (9.0mg). 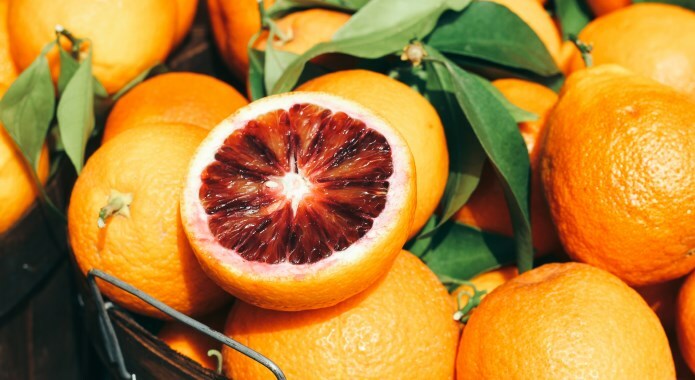 Grapefruits provide only a small amount of vitamin C (31.2mg), and a tiny amount of vitamin A (1150 IU), and choline (7.7mg). This fruit is also composed of mostly water (88.1g per 3.5oz/100g) and contains around 10.7g of carbohydrates. 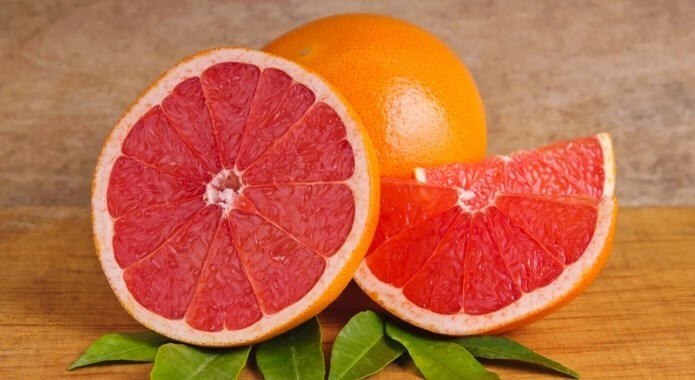 Grapefruits are often used in lemonades and juices. However, you may be surprised by the amount of more complex recipes that use this fruit.